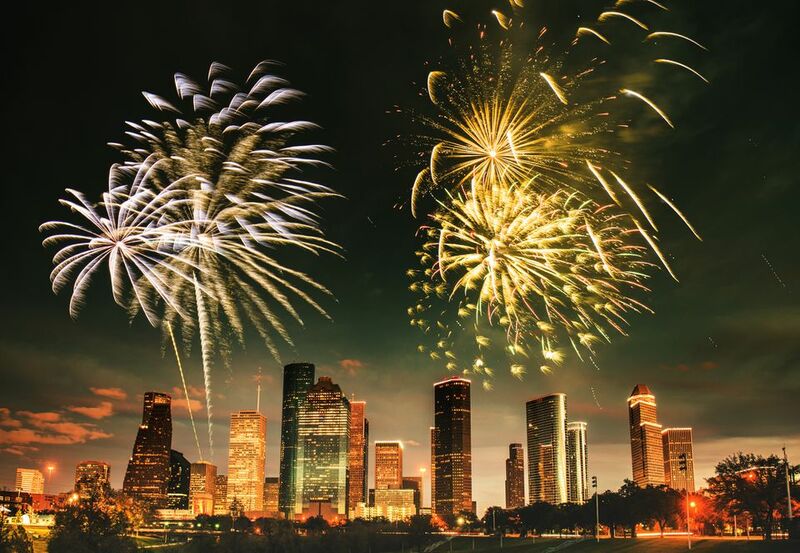 If you're heading to Texas for the winter holidays and want to ring in the new year at a festive event, the city of Houston offers plenty of exciting options on New Year's Eve in 2018. Whether you prefer partying all night or you're traveling with children and want to celebrate early, events in the Houston metroplex cater to every crowd and interest. From hotel parties to wine tastings, family-friendly celebrations to adults-only dance parties, you'll find something for everyone on the last day of the year. Located on the southeastern corner of the intersection of Interstate 10 and Beltway 8 in Houston's Memorial City neighborhood, CityCentre is a retail, dining, and entertainment development that offers events year-round. On New Year's Eve, festivities begin with the kids' countdown to noon, "Noon Years Eve," presented by the Texas Children's Hospital West Campus from 11 a.m. to 1 p.m. Guests can return at 9:30 p.m. for the official countdown celebration, New Year's Eve at CityCentre, which features live music in the plaza by Collector's Item, a Motown group famous in Houston. At midnight, a 60-second firework show will ring in the new year. Parking is available on-site for $10, but tickets are not required to attend this free outdoor event. The parking garages open at 6 p.m., and guests are encouraged to carpool or use rideshare apps like Uber or Lyft to cut down on traffic around CityCentre on this holiday evening. About 30 miles southeast of Houston, the small Gulf coastal town of Kemah is home to a luxurious private yacht company called the Boardwalk Fantasea. On New Year's Eve, you can depart from the Kemah Boardwalk, setting sail across Galveston Bay and Clear Lake to experience the midnight fireworks in style. The $175 per person price tag for the New Year's Eve Fireworks Dinner Cruise affords each guest a gourmet meal, appetizers, and plenty of music and dancing as well as tiaras, champagne toasts, and party favors. Boarding takes place from 8 p.m. to 9 p.m., and the cruise goes until 12:30 a.m. Discounts are available for those in the military and adults aged 55 and older. If a fancy cruise isn't your style, you can also enjoy a family-friendly festival at the Kemah Boardwalk, which ends with a firework show at 10 p.m. New Year's Eve at Kemah Boardwalk features music, dancing, children's activities and games, and carnival-style food for purchase. Admission to New Year's Eve is included with the price of admission to the park. However, you can also purchase a special New Year's Weekend Adventure Pass for unlimited access to the park from Friday, December 28 through Monday, December 31, 2018. For just $40, you'll get access to not only Kemah Boardwalk but the Pleasure Pier and the Downtown Houston Aquarium as well. New Year's Eve is the perfect opportunity to discover these three ​top Houston attractions. Although you may experience slightly larger crowds, the amount of entertainment you'll have access to with an Adventure Pass gives you plenty of time to enjoy all three destinations on your trip. If you'd rather avoid the crowds altogether and spend the final moments of 2018 with your significant other, The Houstonian Hotel—located on 18 acres of woodland near Houston's Memorial Park and across Highway 610 from the Houston Arboretum and Nature Center—is offering a special New Year's Eve package for couples. The Intimate New Year's Eve special includes a luxury yet low-key dinner for two at Olivette, a bottle of sparkling wine delivered to your deluxe hotel room, a champagne toast at midnight as the New York City ball drops on television in The Bar, and a "Southern Traditions New Year's Day Brunch" with ham, black-eyed peas, and greens the following day. Although the price tag for this holiday special runs upwards of $650, everything is included in the fee and the Houstonian is one of the finest accommodations available in the city. You'll also be treated to a late checkout time of 2 p.m., which means you'll have a little more time to recover from all the champagne and sparkling wine before you head out on the first day of the new year. If you're looking for a significantly cheaper hotel experience that still offers tons of fun on New Year's Eve, you can head a little further west to the Memorial City neighborhood of Houston where the Westin Hotel will host a free public event from 8 p.m. to 1 a.m.
New Year's Eve at the Westin Hotel features live music and a complimentary toast at midnight as well as cocktail specials and party favors. Although you don't have to stay the night at the Westin Hotel to enjoy the event, you can also book a New Year's Eve special, which comes with a complimentary breakfast and late checkout time. Nearby at The Square, you can celebrate New Year's Eve outdoors with the ball drop projected on a jumbo screen, free popcorn, and tons of New Year's Eve swag. The event will take place from 9 p.m. to midnight near Maggiano's and The Cheesecake Factory just off of Gessner Road. From 11 a.m. to 12:30 p.m., families can also partake in a Noon Year's Eve event at The Square featuring a balloon drop, lemonade toast, and kids' DJ. With three locations in Houston, the Hotel ZaZa has become known in the city as one of the best local chains for luxury accommodations. On New Year's Eve, you can attend the annual NYE Soiree and book a room for a special discount rate. The New Year's Eve room package includes overnight accommodations, two tickets to the NYE party, a festive bubbly turndown service, and $40 toward breakfast the following morning. To book the package, you'll need to use the booking code "NYE" when checking out on the Hotel ZaZa Memorial City website. One of the biggest parties of the season will take place at the Omni Houston Hotel for New Year's Eve. Presented by Houston Nightlife, "Gatsby's House" is the theme for the annual New Year's Eve Celebration at the Omni Hotel in 2018. On December 31, 2018, from 9 p.m. to 2 a.m., guests of Gatsby's Huse can enjoy five hours of prepaid bar service, four areas for mingling on two floors of fun, music by three of Texas' top DJs, and a countdown like no other. In accordance with the "Great Gatsby" theme, the event will also feature a casino night speakeasy featuring tons of prizes to win, and guests are encouraged to dress up in the best attire they can find from the 1920s (semi-formal or cocktail attire required).